Broadmoor: 'Fantastic' views but would people pay to visit? In Oxford you can spend the night in a hotel that was a former prison, featuring high barred windows, converted cell rooms and prison walkways. In Karosta Prison Hotel in Latvia, the former KGB jail advertises itself as "unfriendly, unheated, uncomfortable and open all year round". Now, West London Mental Health NHS Trust hopes to interest a developer in taking on its old Victorian buildings at Broadmoor high-security psychiatric hospital, to create a hotel and housing. The buildings at Crowthorne in Berkshire were declared "unfit for purpose" by the Commission For Healthcare Improvement in 2003. The trust hopes the development of the buildings will fund a £250m redevelopment of the remaining facilities at the hospital. The homes and hotel rooms would be just a few hundred metres away from the new psychiatric unit, but will be screened by trees and outside the high security perimeter. The trust said it was "confident" a buyer could be found. The Victorian Society, which originally had qualms about the plans, now supports the trust's decision after visiting the site in January. 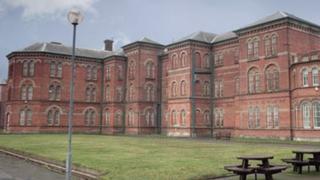 Ian Dungavell, director of the society, said he was keen to protect the hospital's Grade II Victorian buildings, designed by prison architect Joshua Jebb. "Over the years, the government has sold off a lot of old army bases and hospitals which just fell to pieces," he said. "We don't want that to happen to Broadmoor. It has a lot of potential to be used for a hotel and housing". One reason Broadmoor Hospital may be more suited to be converted to a hotel lies in the attitudes to mental illness when it was built. When it opened in 1863 there were none of the drug treatments we are familiar with today. Victorian patients enjoyed a regime of rest and occupational therapy, and were expected to benefit from fresh air, sunshine and spending time outdoors. In the early years of Broadmoor, inmates formed a self-sufficient community with a farm, kitchen garden and sports fields. "The views from Broadmoor are fantastic, across very nice landscape," said Dr Dungavell. "The windows in the former Oxford prison are quite small, but those at Broadmoor seem to be bigger. "It could be converted relatively easily. "It's a good solid building, which has been well-maintained and is well-lit and well-ventilated." Dr Dungavell said large buildings such as prisons and hospitals naturally lent themselves to use as hotels with some modifications. Each hotel room in the A-wing of the Malmaison Hotel in Oxford has been converted from three adjoining prison cells, and features original iron cell doors and barred windows. "Broadmoor has got a good location, not far from Heathrow, near to a golf course," added Dr Dungavell. "Looking around I thought Broadmoor was much less noisy than your standard prison, so even though the hotel would be near the hospital, people wouldn't be affected by noise." However, some may associate the name Broadmoor with some of the hospital's more infamous patients, including the "Yorkshire Ripper" Peter Sutcliffe. Dr Dungavell admitted this aspect might make some hotel guests nervous. "It has more potential for a hotel than we thought, but if you were strolling in the grounds on a light summer evening and you heard some sort of noise in the grounds, you might be scared," he said.